Keo’s Kitchen on 2nd – vegan in your city. A friend and I went out to Keo’s on 2nd (129 2nd Ave N, Saskatoon, SK) last weekend. I’m not sure when they opened the downtown location, but the original Keo’s location (which doesn’t exist anymore) was the first restaraunt with vegan options I ever went to in Saskatoon. So I have some very fond memories related to eating there. This visit didn’t disappoint. At first they weren’t sure where to seat us, so we started out at the bar, but we ended up getting a table. The Broadway Ave location (1013 Broadway Ave, Saskatoon, Sk) can get really busy in the evenings, so I wasn’t sure what to expect with this one. I like their semi open kitchen set up, there is slightly less mystery about what’s happening back there. It was fantastic to be able to see them prepare my meal. Luckily my dining companion likes spicy food as much as I do, so we got it all hot. However, you have to specify your spice level, otherwise they bring it out mild. 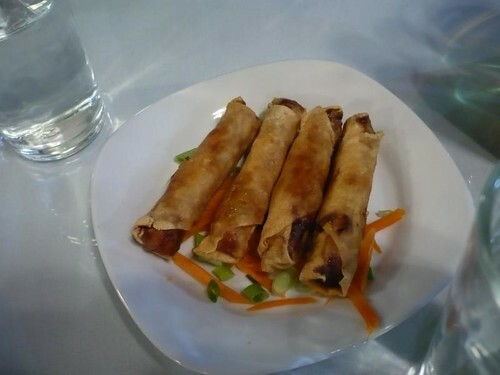 We forgot to specify, despite talking about our mutual love of spice, and why we liked it, for a good ten minutes, and ended up with mild spring rolls, but caught it in time to get everything else delightfully spicy. 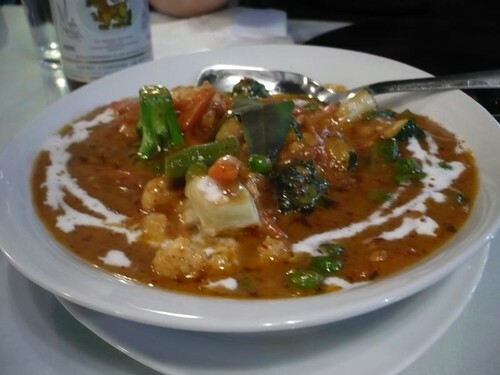 The massaman curry was a wonderful combination of coconut milk, cardamom, tamarind. peanuts and a touch of sweetness. I loved how the veggies soaked in all of the spices, and flavour while still remaining firm. The massaman was recommended on the HappyCow review of the original Keo’s, and it’s been a regular order for me ever since. The pad thai was really complemented by the addition of the crispy fried tofu. If I order it again before I leave Saskatoon I’ll definitely be getting it that way. 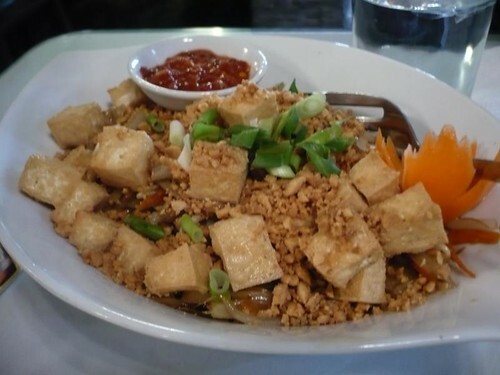 The noodles diluted the spiciness of the sauce, but it had a rich satisfying coconut and peanut flavour. Really worth ordering.